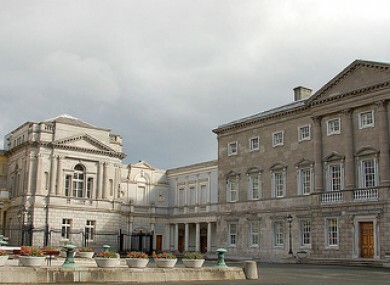 THE TWO BARS in Leinster House have brought in a combined €600,000 in the last two years. In 2011, the visitors bar and the private members’ bar combined to bring in €299,913, with that figure rising slightly to €300,252 in 2012. 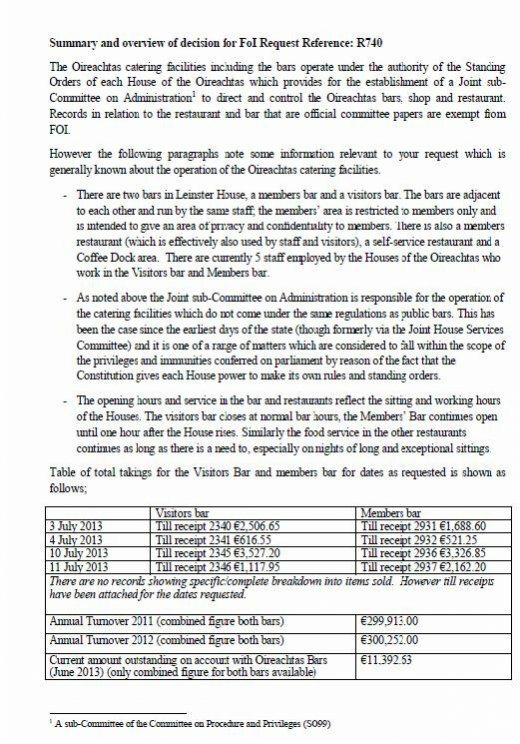 The figures are shown in documents requested by TheJournal.ie as part of a Freedom of Information request on the private members’ bar and the visitors’ bar in Leinster House. The documents revealed that almost €7,000 was spent in the bars during the course of the abortion debate and how much is owed to the bars, with both the bars combining to take in just over €600,000 in two years. Can’t read this? Click here. The Oireachtas said that the bar is licensed under Oireachtas Standing Orders, which provide for a sub-committee charged with running the Dáil bars, shops and restaurants. There are two bars in Leinster House, a members bar and a visitors bar. The bars are adjacent to each other and run by the same staff; the members’ area is restricted to members only and is intended to give an area of privacy and confidentiality to members. There is also a members restaurant (which is effectively also used by staff and visitors), a self-service restaurant and a Coffee Dock area. The Joint sub-Committee on Administration is responsible for the operation of the catering facilities which do not come under the same regulations as public bars. This has been the case since the earliest days of the state (though formerly via the Joint House Services Committee) and it is one of a range of matters which are considered to fall within the scope of the privileges and immunities conferred on parliament by reason of the fact that the Constitution gives each House power to make its own rules and standing orders. The Oireachtas added that there were five staff employed between the two bars and that opening hours were “reflective of the sitting hours of the Houses”. The members bar closes one hour after the House rises. Please Note: This story originally stated that “No records are available for who licenses the Oireachtas bars, how much money they turn over every year or how the bars are staffed.” This was based on the Houses of the Oireachtas’ response to an FOI request from TheJournal.ie. However the Oireachtas has subsequently released information regarding the bars’ licensing arrangements, turnover and staffing to this website and this story has been updated accordingly. Read: How much is the members’ bar owed by TDs and Senators? Email “Oireachtas bars turned over €300,000 last year”. Feedback on “Oireachtas bars turned over €300,000 last year”.